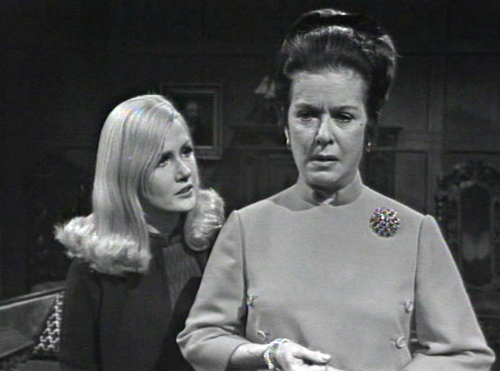 The show opens, as usual, with a mother-daughter argument about why Liz is engaged to the shady Jason McGuire. Carolyn is taking this very personally, and she’s actually bringing some real energy to the conversation. Unfortunately, all Liz can do is keep stonewalling, so there aren’t a lot of emotional places for her to go. I think Joan Bennett looks bored. I sure would be. 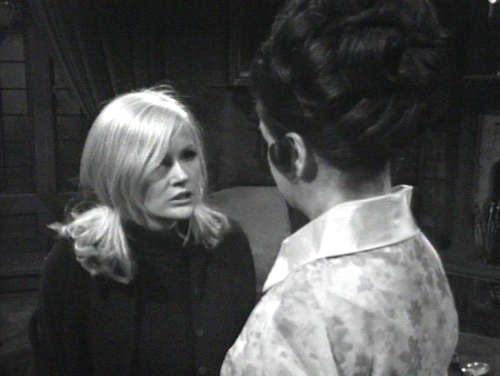 Finally, Carolyn pushes Liz too far, demanding to know if she feels any genuine affection for Jason. Does she love him? Which is not the thing to say to Miss Carolyn Stoddard. She looks like she just got punched in the gut. Which is a nice little dramatic moment for Carolyn, and I can understand how she feels. But, honestly, what is she doing with her life? It’s never particularly clear why Carolyn, a wealthy 20-year-old young woman, is just sitting around the house assembling jigsaw puzzles. She doesn’t have a job, she doesn’t go to school, and she doesn’t even have a boyfriend. These days, she mostly fills her time up with fretting, gossiping and distracting the governess. It’s no wonder she’s taken up nagging her mother as a hobby. Now we get to the moment that I’ve promised was coming: This is the episode where Mitchell Ryan, who plays Burke, shows up at the studio too drunk to go on the air. 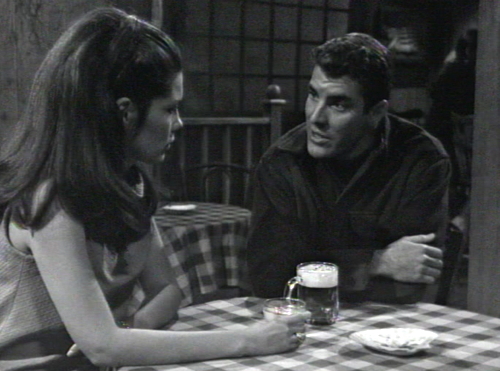 Ryan was relieved of his duties, and they brought Joe in to fill Burke’s part of the episode. The next time we see Burke on the show, two weeks from now, he’ll be played by a different actor. 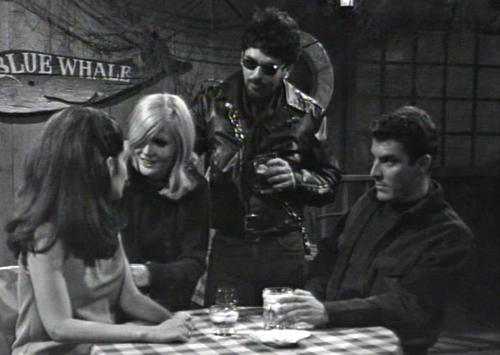 Fortunately, this storyline is so vague and dull that it doesn’t matter who’s sitting with Vicki at the Blue Whale. If Joe wasn’t available, she could have done the scene with pretty much anyone. The one moment that poses a problem is when Joe says, “She can’t be blind to what kind of a person that McGuire is.” That’s clearly a Burke line. I don’t think Joe even knows who Jason is. But the show must go on. Enter Carolyn, who’s doing something with her life. Specifically, she’s drinking, and riding around on a motorcycle with a guy named Buzz. Which is not a bad option, if the alternative is sitting around in a gloomy old house, doing jigsaw puzzles and criticizing your mother’s life choices. Buzz is wearing a leather jacket with studs and chains; he’s got sunglasses and a goatee, and there’s something going on with his hair that I can’t actually comprehend. Buzz is out of bread, so Carolyn buys the drinks. She orders a stinger for herself, but Buzz wants to stick with beer. And it really is a shame that this was the day that Mitch Ryan had to miss. The entire episode is about drinking! He wouldn’t even have to use his sense memory to get into character. Carolyn spots her friends at the table, and they stumble over to say hi. Vicki and Joe are not amused. Carolyn introduces Buzz, and they both stare at her with the kind of frosty glare that you can only direct at people who have had slightly more to drink than you have. But Carolyn is keeping up the conversation. Carolyn: Oh, I just had the most wonderful day I’ve ever had. We’ve been up and down every road, across every field, and on the beaches. It was living, Buzz, wasn’t it? Buzz: A gas, man! A gas! Carolyn invites Vicki to take a ride on the motorcycle; Buzz is happy to take her out. And apparently we’re supposed to think that Vicki is being patient and noble, and that Carolyn is out of line. That is not my assessment of the situation. I think that Carolyn’s had another in a long series of stressful weeks, and now she’s spending a pleasant evening out with an agreeable and attentive young man. 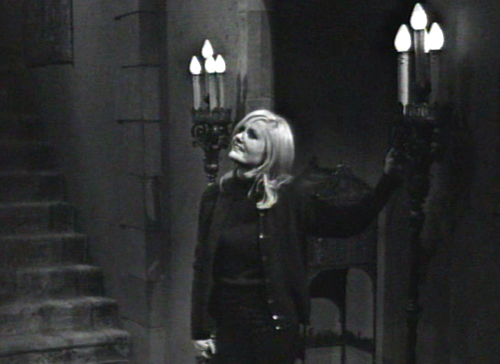 Vicki and Joe need to lighten the hell up. Which is clearly the right answer. How awesome is Buzz? He’s marriage material. She invites him in, and he’s impressed. Buzz: People live in this place? Carolyn: Not really. It’s the kind of place people exist in. He jokes, “See those stairs! I’d like to take my bike and zoom right up it!” She thinks that’s hilarious; she says they should go bring the bike in and try it out. There’s only one area where I think Buzz could use some constructive criticism, namely: He doesn’t dance. Carolyn puts on some music and starts thrashing around. Buzz does a couple steps, but then he sits down and just snaps his fingers. I think Buzz could work on coming out of his shell a little more. The party is interrupted by Liz, who’s come all the way downstairs to tell them that it’s three o’clock in the morning, even though there’s a perfectly good clock in the foyer that they could have consulted if they were curious about the current time. 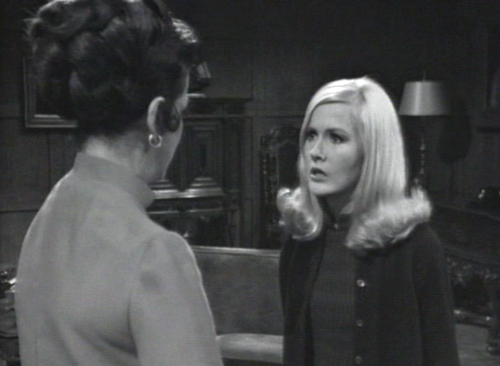 Liz snaps, “You’d better get out of here,” which is simply rude. Buzz objects, “I mean, like wait a minute now, Mrs. Stoddard,” and you have to admit that he’s got a point. She explains that Liz is going to marry Jason McGuire, so she’s going to have a brand new name. Carolyn: Because I want her to get used to it. I want her to know how it feels to be Mrs. Jason McGuire. I want her to be proud of the name! You are proud of it, aren’t you? Mrs. McGuire? 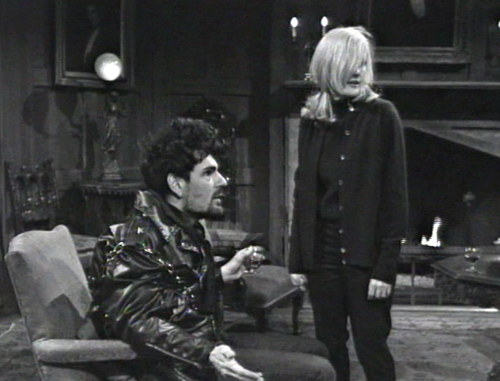 Carolyn: What’s the matter, Mrs. McGuire? Don’t you like your new name? She pounds on the table. Carolyn: Mrs. McGuire! Mrs. McGuire! MRS. MCGUIRE! 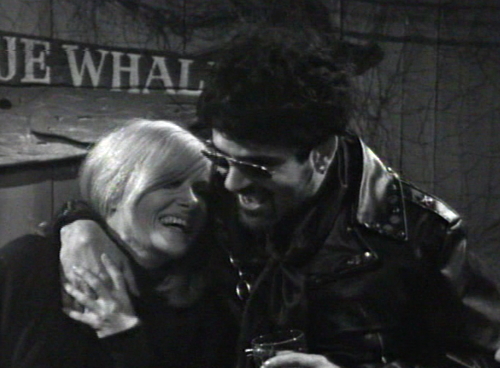 Carolyn: So you’ve found LOVE, Mrs. McGuire? Well, SO HAVE I ! And Carolyn throws herself into Buzz’s arms for a passionate kiss. And the door is stuck. She can’t get it open. 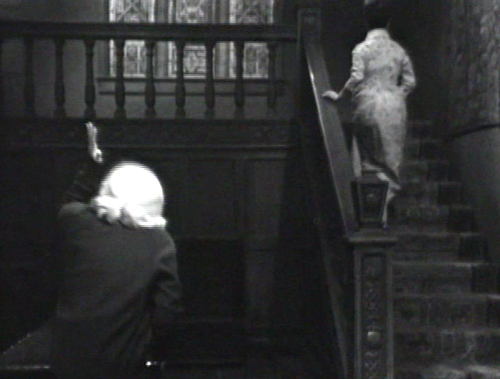 She struggles with the doorknob as the scene fades out. 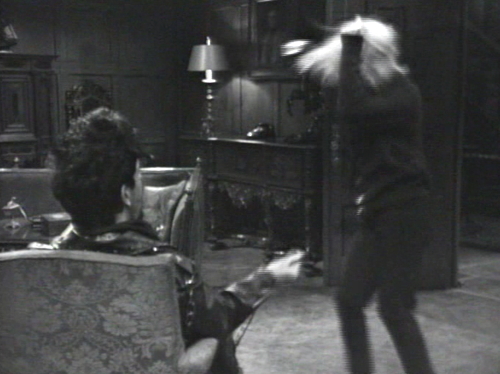 Which makes this one of the all-time great scenes of television. Great acting from Carolyn. Some of the truly last great scenes for her before it becomes the Spook show. Awww, no more Mitch Ryan? So this was why Joe was in the scene. There needs to be a Buzz fan club. 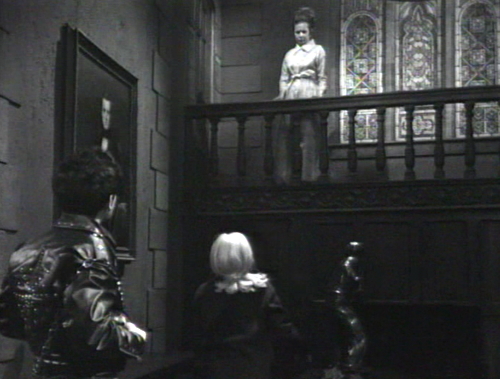 LOVE the ending scene with Carolyn shrieking “Mrs. McGuire” over and over as the usually in-control Liz flees up the stairs. The stuck door just made it all the better. I know the Basement Storyline is plodding at times, but I kind of like this period of DS when there are things both natural and supernatural upsetting the household. Oh my word the stuck door had me howling. I was hoping she’d start kicking it. And Joe Haskell officially becomes a Sympathy \ Recap Monkey. Wow, Carolyn has big curls in her hair! I have never had hair that could curl like that.